Easy access for all ages. Great location. Secure back garden and only across the road from the sea. 20 minute walk to Clacton's pier and all this seaside town has to offer. 3 bedroom which consists of 1 double and 2 twin. Cot and high chairs available upon request. Check in from 2pm and check out 10am. Saturday to Saturday. Price includes linen, towels, gas, electric and wifi. The property has two parking spaces. A lovely links course about a mile away. Great spot right on the sea front, perfect base for visiting the area. House was clean, cozy and well equipped . The welcome basket of goodies was a nice touch. The owners were very accommodating and helpful. A great rental for our family of 6. Would definitely come again. Thank you. Great guests ,and happy they had a lovely stay. Look forward to their return in the future. Great spot, great views, all you need. Private, perfect for the dog. 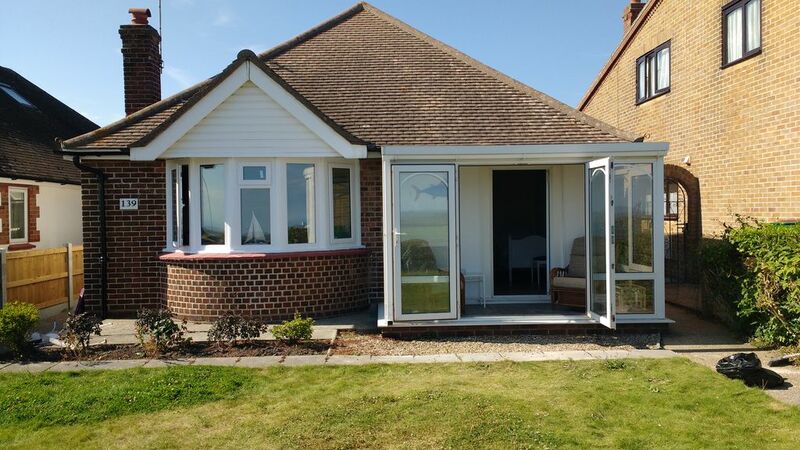 Excellent bungalow on Marine Parade over looking the sea. Never realised how large a 3 bed roomed bungalow could be. Ample space for 6 people fortunately there were only two of us who had a most enjoyable break. All facilities on hand and a nice welcome gift to start us off in the kitchen The owners had thought of everything even. games for the children 'heaven forbid' it should rain. Beautiful well equipped clean easy access bungalow with a parking space. Easy to book and got our deposit back the day we returned the key. Would definitely recommend. What a perfect set up. Nice and warm with all you need, right down to the welcome package. No problems and would certainly recommend. Will be booking again. Glad you enjoyed your stay. Hopefully see you again. Ideal setting with lovely sea views. The house was quite spacious and it was lovely to have such a great sea view. Nice touches with the supplies left at the house. It suited our needs very well. The house was much nicer than portrayed on the website so it was a surprise when we walked in. Thank you very much for your lovely comments. We are glad you enjoyed your stay and hope to see you again soon.